In this post we will explain (and show you) how to keep your Flint & Flame knives super sharp. Of course, one huge advantage of buying your kitchen knives from Flint & Flame is that our knives are super sharp from day one, and because they are made from high quality German carbon steel they stay that way for a long time. However, there comes the day in every knife’s life when it is time to ‘sharpen up’. In this short video from Flint & Flame TV you’ll see exactly how to sharpen your Flint & Flame knives using the Flint & Flame handheld ceramic sharpener. As you’ll see, once the sharpener is loaded with water you are just a few seconds away from a perfectly sharp knife. As you will have seen in the video, the sharpener has two ceramic wheels on an axis. Each of these is at a slight angle, which is very important. The angled ceramic discs are specially designed to generate the 18-22 degree angle that is so important to getting the super clean slice that Flint & Flame are famous for. In addition you will have noticed the little reservoir in and around the wheels, which is where you put the water to make the blade damp. 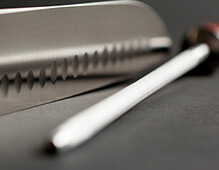 Once the reservoir is full, you simply place the knife through the guides on the handheld sharpener onto the ceramic wheels (the guides create the perfect 18-22 degrees required for the perfect blade), pinch the blade down against the wheels and simply rock the knife forwards and backwards five or six times. Your knife will now be razor sharp.